A picturesque landscape of rolling hills and secluded valleys covered in vines, pasture and forest. 7 nights in a mixture of good quality hotels and B&B's. They have been chosen for their local charm and warm welcome. Four evening meals and four picnic lunches included. 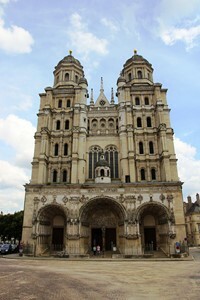 Travel to Dijon, France at the start and from Chalon sur Saone at the end of walking holiday. Lunches on arrival and departure days plus lunches on 2 other days, 3 evening meals. Any excursions and entrance fees. Our Classic Burgundy Trail takes you not only through some of the most famous vineyards of Burgundy's Pinot Noir region, but also explores less well-trodden paths through secluded forests, deep coombes and grassy hills with wild flowers and great views. This independent walking holiday starts in the beautiful historic city of Dijon, capital of Burgundy, with rich archictecture from the gothic period onwards. It has a large number of churches and many beautiful town houses. Many of the roofs of the historic buildings are covered in glazed, patterned tiles. Your walking trail then heads south through some of the most well-known Burgundy premier cru wines and vineyards in the Cote d'Or. The famous Cote de Nuit and Cote de Beaune wines are made from Pinot Noir grapes and have become some of the most sought after wines in the world. The French region of Burgundy is well-known for its fine wines and gastronomic food, a reputation that is richly deserved. You will have plenty of opportunity to sample both during your self-guided walking holiday between Dijon and Buxy. Our walking trail also takes you away from the vines and into secluded valleys and onto grassy hills with far reaching views across the vines. Pass through pretty villages with chateaux such as Rochepot, as well as visiting the important wine centres of Nuits St Georges and Beaune. 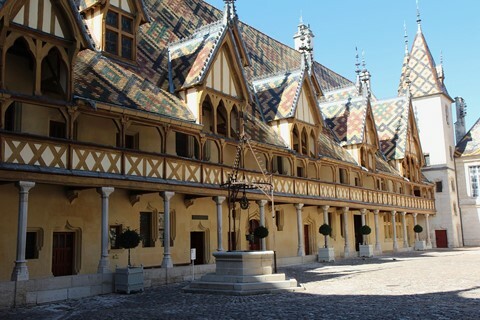 Beaune is an architectural gem with a large and well-preserved historic centre. This independent walking holiday is moderate in grade although the last 3 days are at the upper end of the grade. The walking distances for some days can be varied to suit your wishes. The distances vary between 16km and 22km on any given day. Although the hills are relatively small, on some days there are multiple climbs leading to over 600m of ascent. The average total daily ascent is 480m. The walking trail follows small paths, tracks and quiet roads. The paths are generally good, although they can be rough and stony in places. Arrive In Dijon, capital of Burgundy. Explore the historic city centre. Extra night possible in Dijon. Breakfast and transfer to Chalon sur Saone. On this independent walking holiday in Burgundy you will be staying in a number of charming and very comfortable guest houses and hotels full of local character. All rooms have private bathrooms. 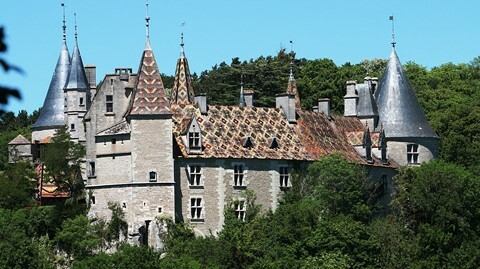 Examples of the guest houses used on this French walking holiday are shown below. A hearty and healthy continental breakfast provides the perfect opportunity to discover the local specialities such as home-made jams and local cheeses. At midday you will eat a picnic lunch lovingly prepared by your hosts. Some evening meals will be taken at your guest houses with your hosts, where you will be treated to local delicacies and have the opportunity to discover more about the region and its people. Some meals will be taken in a local restaurant where you will have a choice of menus. Local specialities will be available to try every evening. Holiday starts in Dijon. Make your own way to the first hotel. The airlines Easy jet and British Airways have scheduled flights from the UK - Luton, Gatwick, Heathrow & Edinburgh - to Lyon St Exupery airport. Flybe also has a number of regular flights from UK airports including Birmingham. Air France & KLM flights via Paris or Amsterdam. Tram service to reach Lyon Part Dieu. Trains from Lyon Part Dieu direct to Dijon. Eurostar and the TGV run trains from London to Lyon Part Dieu direct and changing at Lille or Paris. Then local TER train to Dijon. Alternatively change in Paris and take TGV from Paris Gare de Lyon stopping in Dijon or local TER train from Paris Bercy to Dijon. Transfer at end of holiday to Chalon sur Saone train station from Buxy. This is on the Paris-Dijon-Lyon line. Note: Please check concerning the availability of a walking holiday before booking any flights. If you need further information or would like to discuss any aspect of your travel arrangements, please contact us, we’re here to help you. We would be happy to book travel arrangements to Lyon, France on your behalf. Channel ferry crossings from Dover to Calais in France are provided by a number of operators including P&O Ferries & DFDS seaways. Crossings are also provided by train with Eurotunnel. Once in France, the journey from Calais to the Burgundy area takes about 5 and a half hours (excluding long breaks). Tolls amount to about 40 euros each way. Controlled parking is available in Dijon.